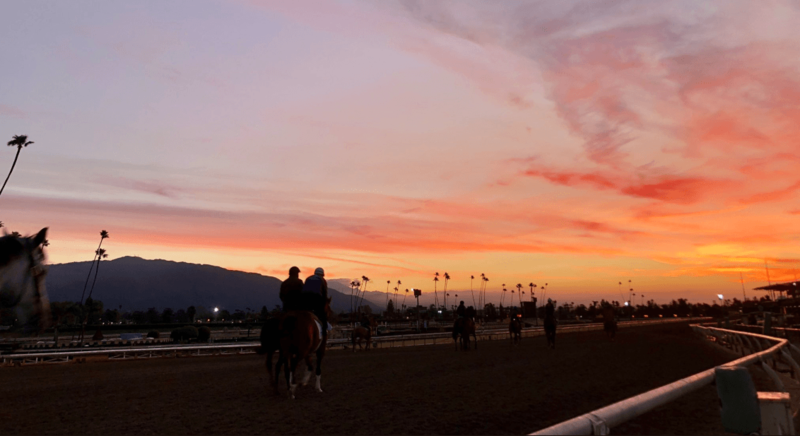 Officials at Santa Anita Park announced late Tuesday they would close the California track indefinitely after a horse needed to be euthanized due to sustaining an injury during training. Santa Anita officials have announced the suspension of racing and training at the California track after a filly was euthanized after sustaining an injury on Tuesday. (Image: Santa Anita). That brings the number of horses who have died at the track up to 21 since late December. The Stronach Group, which owns the track, announced it will conduct testing on the facility’s main dirt track to determine its fitness for racing and training. 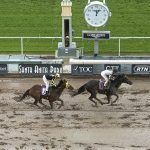 Already, track officials have announced that this weekend’s stakes races, including the Grade I Santa Anita Handicap and the Grade II San Felipe – one of the top Kentucky Derby prep races – will be rescheduled. Earlier in the week, the track canceled its card for Thursday, citing forecasted heavy rains on Tuesday and Wednesday. Santa Anita officials said the move was made to ensure quality racing took place over the weekend. However, the track stayed open for training, and on Tuesday, a filly owned by trainer Ron McAnally had to be put down after suffering an injury to her front right leg. Prior to announcing the indefinite closure, Santa Anita revealed a former track superintendent had been retained to consult with Santa Anita officials and inspect the main course’s surface. Dennis Moore, who retired from Santa Anita in December, has more than 46 years of experience in the industry. Once officials decided to suspend racing, they announced that Moore would conduct more tests on the track. Among the new steps that will be taken include a surface tester that replicates a horse running at full speed. Those come after a University of Kentucky expert used radar to inspect the course last week when heavy rains pelted the track and confirmed its readiness. Stronach officials are also examining all current safety measures at Santa Anita. 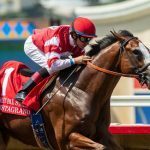 The California Horse Racing Board’s equine medical director told the Los Angeles Times he agreed with the decision to close the track. 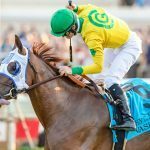 With the San Felipe now delayed, racing fans will wait to see what trainer Bob Baffert plans to do with a pair of his top Derby contenders. 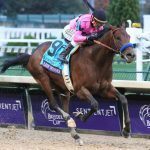 Both Game Winner and Improbable were set to make their 2019 debuts in the stakes race where the winning horse receives 50 points toward an entry into the 145th Kentucky Derby. At William Hill, Game Winner, who won the Breeders’ Cup Juvenile last fall, is the 9-2 favorite. Improbable sits right behind him as the second choice at 6-1. Churchill Downs, which will conduct another round of Derby Futures betting this weekend, lists Game Winner at 5-1, with Improbable at 8-1. Other top prep races planned for this weekend include the Tampa Bay Derby at Tampa Bay Downs, the Gotham Stakes at New York’s Aqueduct and the Jeff Ruby Steaks at Kentucky’s Turfway Park. The Tampa Bay and Gotham winners will earn 50 points, while the Jeff Ruby winner is afforded 20. The next major test for contenders would be the Rebel Stakes at Oaklawn Park in Arkansas the following Saturday. That winner will receive 50 points. War of Will leads the prep race standings with 60 points. Code of Honor, who won last weekend’s Fountain of Youth, is in second with 54. Game Winner currently resides in third with 30 points. At Churchill this weekend, War of Will will start with 10-1 odds, while Code of Honor will be the third choice at 8-1. Futures betting will start at noon ET Friday and conclude Sunday at 6 pm ET at Churchill Downs and TwinSpries.com. Up to 20 3-year-olds will race in the Derby.